A stunning blend of creamy Welsh goats cheese, roasted red peppers and spinach that mixes the glamour of Hollywood with the best of British taste. 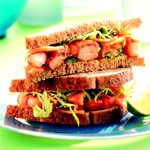 Robed in a rich wholemeal bread, this sandwich looks and performs like no other. Bright and brash on the outside, only a large bite could possibly uncover its deeply layered inner secrets. A true star is born! Spread the bread with the butter and place buttered side up on a board. Top one slice with the goats cheese, the pimentos and spinach leaves. Top with the second slice of bread, press together firmly. Remove the crusts, then cut diagonally into four triangles. What could be a better start to a day’s hard debating in the commons than one of our most traditional and best loved breakkie bites. 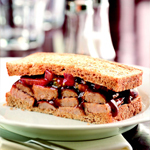 A time-honoured combination of rich tasty bangers smothered in Houses of Parliament sauce on hearty brown bread – a true British classic, the choice of generations. You may not agree with their policies, but you can’t fault their taste in butties. Definitely a vote winner. Spread the bread with the butter and place buttered side up on a board. Top one slice of bread with the sliced sausage, tomato and brown sauce. Top with the second slice of bread, press together firmly. Cut in half and serve. The well-travelled rock stars favourite. 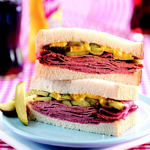 A nostalgic taste of life stateside – luscious layers of heavenly pastrami, sliced gherkin and American mustard bring back memories of heady touring days and late night stops in old-fashioned diners. A colourful, classical medley of flavours, this one’s made for a life on the road. Our verdict, a guaranteed hit. Spread the bread with the butter and place buttered side up on a board. Top one slice with the pastrami, heaping it up in the middle. Top with the gherkin, then the mustard. Top with the second slice of bread and press together firmly. Cut in half and serve with extra gherkins if liked. The complete post match meal after the big game. Tasty cheddar cheese, thick cut ham and juicy tomatoes provide a balance of protein, carbohydrates and vitamin C – perfect for replenishing all that spent energy! 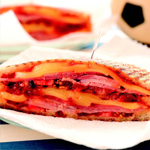 the choice of the professional – lightly griddled, satisfying, quick and easy – truly fit for the premier league. Heat a griddle pan until hot. Toast one slice of bread on both sides on the griddle pan. Spread one side with butter and also the two slices of bread. Top one of the slices of bread and the toasted bread with slices of ham, cheese, tomatoes and chutney. Lift the toast on top of the piled up bread, then top with the final slice of bread. Press together firmly. Cook the sandwich on the griddle pan for 2 minutes on each side until toasted. Diagonally slice in half and serve speared with a cocktail stick if liked. 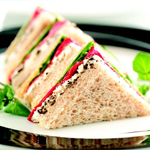 A deliciously tempting and beautiful sandwich with an antipodean edge. The combination of griddled tiger prawns and fresh papaya in a sharp lime and chilli sauce is typical of the Aussie flavours dominating the British scene. Exotic and eye catching, from humble beginnings to top billing, it’s fast becoming a real obsession that looks like it’s here to stay.